As the East Side early birds amused themselves scanning the water for sharks and body parts, the Kahana crew witnessed an exciting tandem launch that would prove to be a record breaker. The title of this article applies to those they left behind at Kahana: fear is the feeling our launches and landings evoked in each other; uncertainty describes our grasp of the weather; and doubt is the reason there weren't two pilots breaking that record today. Don had reported beautiful morning conditions at Makapuu, but by the time I finished my household chores, Ken was calling me to report that the wind was brisk and super east there. So I opted to stay close to home, and met Stalker, One Eye and Christine at Kahana, along with visiting legend Marty and his wife Carmen. We checked the wind and the easterly cloud drift, and hiked to low launch. When we got there the wind was howling, and we watched Marty and Carmen get sucked off the hill in very strong cross flow. It was so cross that Jeff asked if we should be on the North ridge. Pshaw! In these east conditions? That's crazy. It just flows cross here because of the topography. So I launched next and got dragged off launch as well, then fought through some hideous bumpy strong air to what felt like a safe spot just offshore of the north ridge. The air felt wrong, like the lift was all chopped up and in the wrong places. I figured it had gone too east and we were all gonna have real interesting landings soon. 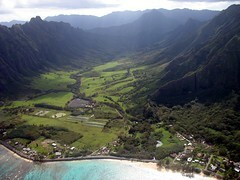 Although Marty was specking out over Quentin's brother's house in Punaluu. A strange place to be finding lift on a super east day. Finally it dawned on me that it was actually a NORTH day here, not east at all. Super north, practically coming around the corner. Doh! Sorry guys. I told Marty it was a good day to try and cross the bay and head in the direction of Makapuu. He took me literally and headed to Makapuu. Like, seriously, all the way there. I wanted to follow him but I wasn't quite as high and was worried I was too low to cross, so I turned back to tank up. But obviously I didn't tank up enough because I didn't make it. So I tanked up again, as I watched Marty sky out to three grand above Kaaawa. As I tried to cross a second time, Marty cut behind Kualoa straight past the pyramid at Ohulehule to the back range. But again I was too low to get across. Arrgh! I went back and tried again. By this time the wind had lightened considerably, and the other guys were ready to consider joining us. Navy Don had hiked up and was laying out first. He snuck around to the north ridge and got up to share some nice thermals with me before I got to two grand for my final attempt at a bay crossing. This time I made it without much drama, but by now Marty was long gone. As I was crossing, I watched One Eye launch and try to sneak around to the north ridge as Don had done. But he didn't quite manage to find the lift line, and ended up making an unplanned top landing as he sunk out on the north ridge. Cool! So he lugged his gear around to the front of the ridge to relaunch. Meanwhile Stalker launched and squeaked around to the lift band, and happily joined Don in the air. One Eye relaunched low on the north ridge but didn't manage to get up, finding himself super low over the Punaluu pastures. He aimed for a large pasture but didn't quite make it, and we watched with horror as he plunged down into a small spot surrounded by tall trees. I thought for sure he was a goner. But he radiod back that he had landed and was fine! Two lucky unplanned landings in one day - that's pushing it. Meanwhile I made my way to Kualoa and found myself in huge lift, getting higher there than I ever had before. By this time I knew Marty had reached Makapuu - I'd heard Scrappy on the radio saying "Where the heck did that yellow glider come from?" But now I was on my own, and I wasn't feeling brave enough to jump back to the main range. I knew I wanted to go but I couldn't quite make myself do it. Next time I hope to be there with someone else to share the adventure of jumping back. So I headed out over the water and back towards Kahana. As I got back, Christine launched last and worked valiantly to squeak around to the north ridge, but found herself super low and wisely headed for the LZ. I followed her in and managed to soar the trees for a long time, finally landing after something like three hours in the air. Jeff and Don came in soon afterwards and we picked up Jim in Punaluu. Thanks for the refreshments, Jim! Sorry about the wrong call on the wind today. I don't how I got that one so wrong. Next time you guys can make the call! The Makapuu Express on a tandem, can't say we fly Kahana much in those conditions. Excellent job Marty and Carmen, next time put a leash on Alex so he doesn't get lost! For that day I happened to run the thermal predictor link after the approx 3:45pm update. I know, late for a "prediction", but with our unlucky raob schedule that gives the truest picture of "today", at least for calibration against real flights. It gave the highest reading I have ever seen here, and made me think of raising the max reporting height. Interesting to see that had at least some validity even on a windward side, because effects of cooling sea breeze and mountain heating aren't really factored in. Some more brainstorming on forensic meteorology... High temps vary across the island quite a bit. but that archive seems limited to HNL. Some short term ones for east and west side are http://www.srh.noaa.gov/data/obhistory/PHNG.html and http://www.srh.noaa.gov/data/obhistory/PHJR.html . You like those nightime accumulations of cool winter air, and that probably does give good insurance that SOMETHING will happen the next day. But here goes some arguments that the boring daytime observations with modest TI numbers (but going to higher altitude) are very interesting too. 1) the very cool readings down low in Lihue and Hilo in the winter are suspiciously like localized radiational cooling. I think they must launch the balloon significantly inland to avoid the airport airspace, while our morning launches are very close to the moderating ocean. Maybe this cooling could help for a east facing launch in the morning on our westerly mountains (any?). 2) a deep minus number of TI may be less helpful since it is gradually filled in by lukewarm morning thermals. As Kevin Ford's readme says "the actual difference between a rising air parcel and the surrounding air is usually not more than .1 C, however. Therefore the t.i. value is not very useful in determining thermal strength". I think it could be a help if we had rocky triggers facing morning sun like in Arizona. 3) the height of convection are said to be the most important (regardless if you want to get that high or if blocked by cloudbase). Consider an afternoon raob reading showing almost 0 TI where the real temperatures follow the lapse going up high (the normal result of thermals filling in the midlevels with warm air). This can actually be great, especially with a dry slope baking in afternoon sun like leeward! The sun will further increase ground level temps, and once lifting off the thermal should have a free ride quite high and even beyond the previous inversion. And height lets it get organized? Seperate issue - I wonder if Ford's cloudbase estimation is any better than the questionable ones on the Airsports web page, and if NWS archives observations of that anywhere.